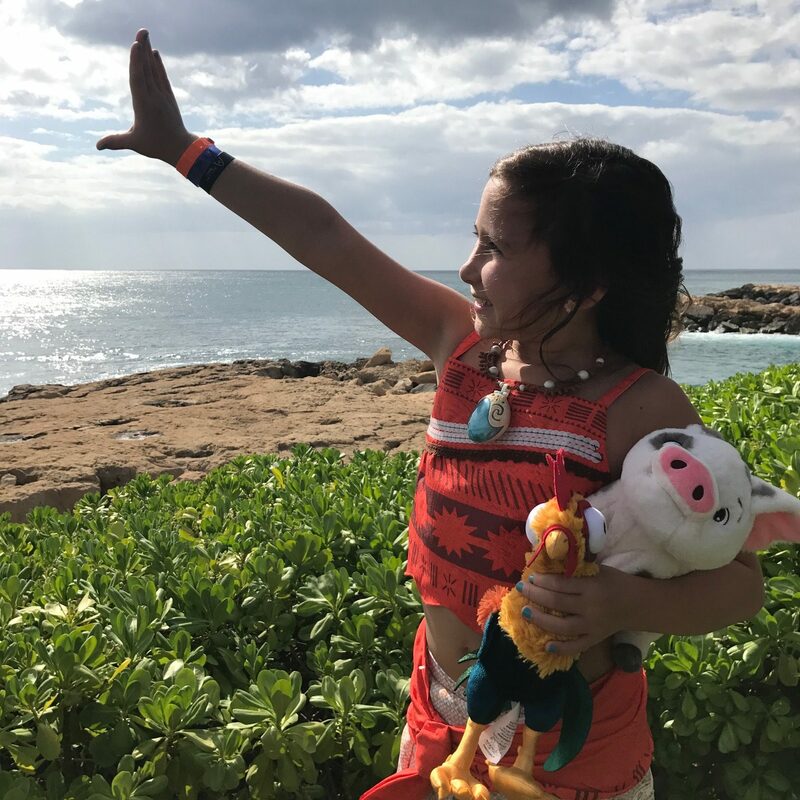 If you’ve been considering a visit to Hawaii with your family, and have thought about whether the Disney’s Aulani is the place for you, here’s my honest review of our experience. Before I give you the scoop on Disney’s Aulani, I want to share a little advice on booking flights, particularly if you live on the east coast, which no surprise here, tends to be the most expensive in terms of flying. We decided to go in August because well, that’s when the yoga retreat was, but it’s also considered the off season, so flights were in the $700-800 range. The weather was fine, with only one day being super hot, but you know, you’re in Hawaii surrounded by beaches and pools so it could be way worse. I debated whether I wanted a direct flight, but due to price, I opted for a stopover and I’m glad I did. The flight over we had a short layover in Chicago, which wasn’t super ideal because we still had a solid 9 hours to go after the initial quick flight. On the way home, we stopped in San Francisco, which was just about half way, and it was brilliant. We stretched our legs, had a decent meal, and charged our gadgets. So before you decide to try a non-stop flight to Hawaii from the east coast, that’s a little something to consider. Unlike other Disney properties, or at least, Disney World, there is no transportation included. You can book transportation, or you can rent a car. We opted for the latter, because by the time you pay for transportation for 6 people to and from the airport, it really adds up. Plus, we wanted to explore the island, so for us, it was worth the money to rent a car and drive ourselves to and from the airport, and as it turned out, pretty much all over the island. The Disney Aulani is about 45 minutes from downtown Honolulu and an hour from the North Shore, so you’re definitely off the beaten path. That could be good or bad, depending on what you want. We did a lot of driving and were perfectly fine with that, because we wanted to see more of the island than just the resort. Pretty awesome view from our balcony! In very true Disney style, everyone is happy and friendly. You’re greeted with a lei, then given the lay of the land, which at this hotel includes lots of pools (all manned with lifeguards), as well as a very clean, well-maintained beach. We got two standard adjoining rooms, with an ocean view upgrade, and there was plenty of room for all of us (3 people in each room), though we would have been fine with four people in a room as well. The fridges were super helpful, and made keeping the food that we bought (more on that in a few) a whole lot easier. Our friends got a room with a kitchenette, which is a very smart way to go. I’d definitely recommend that option if you’re staying for awhile. And even though the resort is big, I never felt like I had to walk super far to get to things, which is a big deal when you’re dealing with kids. Everyone is outfitted with a band, which you can use to charge things to your room. Your kids can get that privilege as well, which we skipped, because dang the food was expensive. In fact, other than the complimentary character breakfast and one or two lunches by the pool, we ate at restaurants outside of the resort or from our own food for the entire trip. Sorry, but I am not going to pay $3 for a juice box. 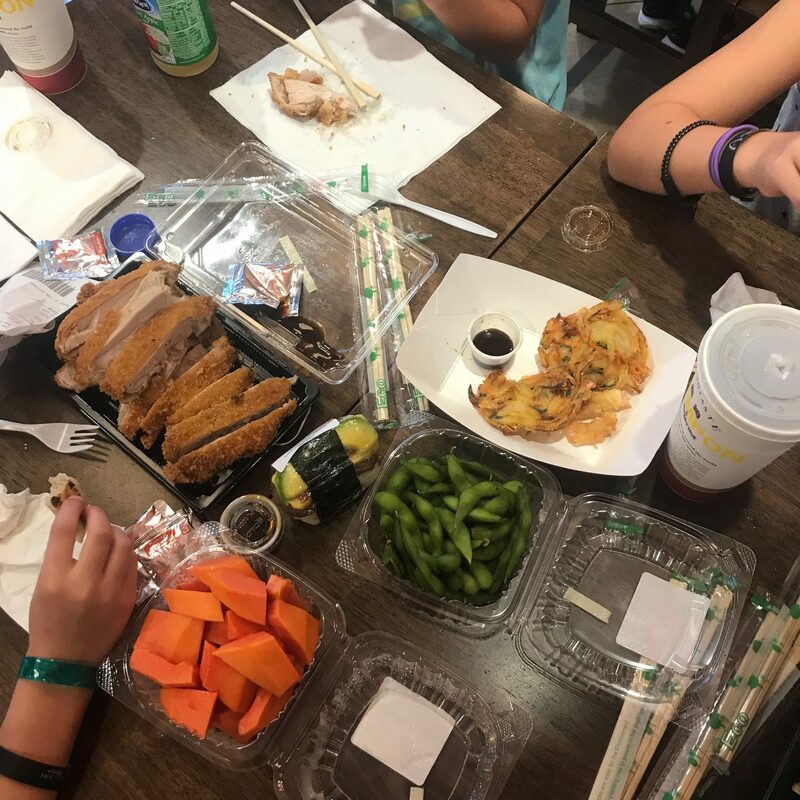 Similar to many of the reviews out there, the food that we had was average at best, as were the drinks, and while the cafe’ had lots of options, especially for gluten-free folks like me, it was difficult to stomach the prices. There are a couple of restaurants right outside the resort, including the popular MonkeyPod, but my feeling is that would get old after awhile. Or like, two meals. I felt like the pool-side service was slow, and while they were attentive to their hour rule with pool seating (they time how long people have been gone and if the hour is up, they make the chairs available – which, smart), they were not so much with drinks. The Shirokiya Food Court (Japan Village Walk)- also worth the drive. There’s a Target super close, as well as a Costco, and that made the car rental worth its weight right there. We stocked up after we checked in, then one more time during our visit, and we were set with breakfasts, with alternating lunches or dinners out at some of the places recommended to us by friends. 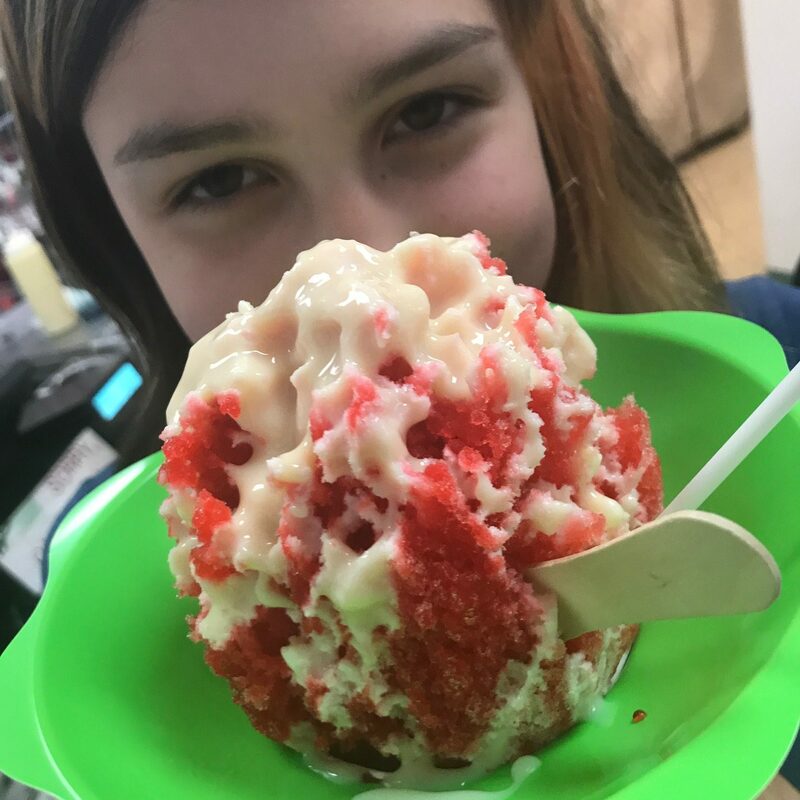 There are so many amazing restaurants on the island, that you are missing out if you don’t hop in a car (or a Lyft) and eat at them. There’s something to be said about all the pools and activities at the Disney’s Aulani because they do a great job at keeping kids busy. 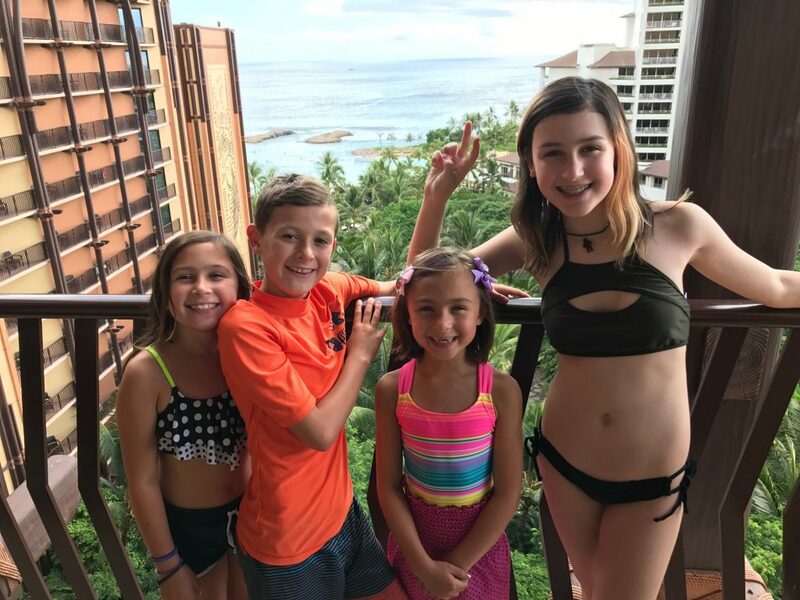 My kids — 13, 11, 9, 7 — were occupied the entire time, jumping around from pool to pool. The water slides were fun, but nothing super amazing, but with lifeguards at every pool, I felt comfortable planting myself in a spot, and letting them roam. Yes, that blob is a very cute seal! The beach is nice, but nowhere near the prettiest on the island. 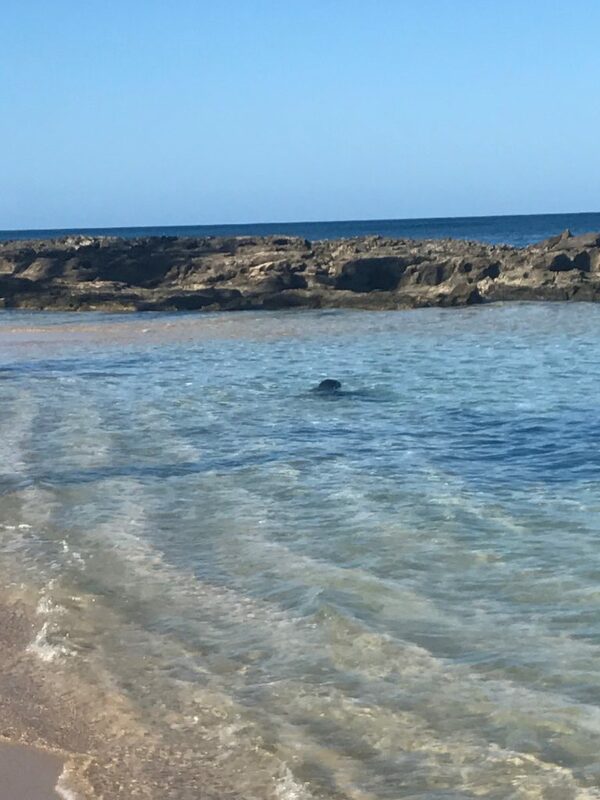 In fact, the beach right next door (a short 10 minute walk) had a seal swim right up to us during a yoga session. The water was bluer and the sand was softer. That being said, we did some paddle boarding and snorkeling, and the water was calm enough that the kids felt safe to go in and play more than they might have otherwise. But it is not the big draw at this resort, by any means. 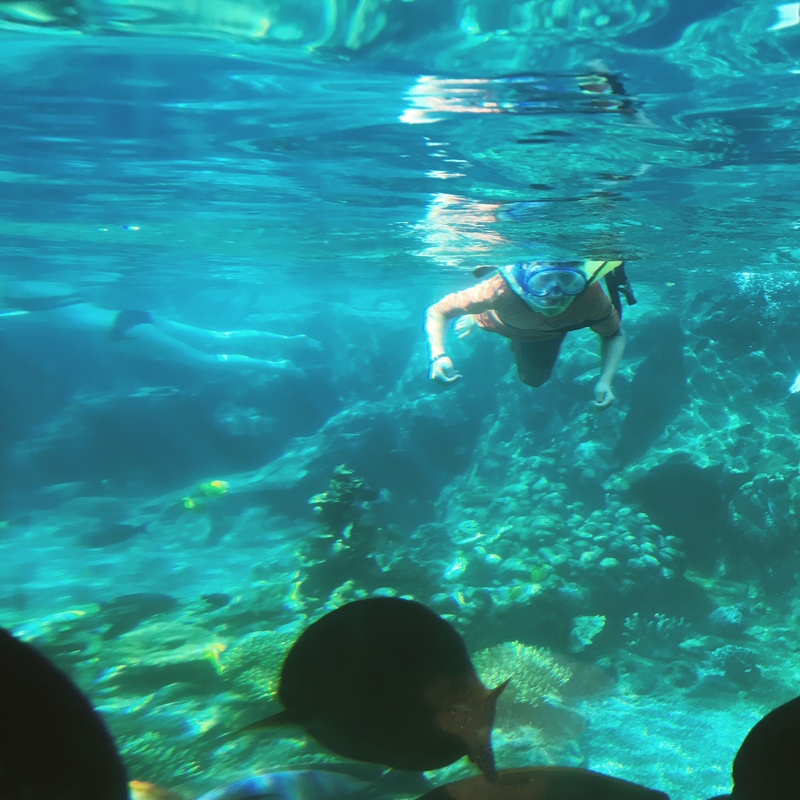 They can snorkel at the special Rainbow Reef (above), which allows guests to swim with various local fish in a safe, enclosed environment. My kids loved this, and the money we spent on a week pass was well worth it. We didn’t necessarily need to rent the gear because we brought our own, but my son in particular loved being able to go swim with the fish whenever he wanted. The water is freezing cold, so be warned. It was shocking, even in August in Hawaii. Another bonus to Disney’s Aulani is the kids club, which my kids were resistant about until our second to last day when they finally relented and never wanted to leave. It’s a great break from all the swimming and running around, and lets you go out to eat or just chill at the bar for a little bit. 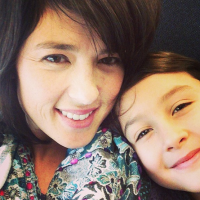 Family vacations are awesome, but everyone needs a little break now and then. Their popular luau was perfect for our family. I had planned on doing the one at the Polynesian Cultural Center, which has an amazing reputation, but convenience won and we stayed at the resort for their version. It was a little less risque’ (no coconut bras), but still entertaining with decent, but not spectacular, food. There were a few activities for kids to do to keep them busy while they waited for food, and then the show to start. You can do as little or as much as you want, and to be honest, the general Disney ra-ra stuff seemed pretty subtle to me. I think I only saw a big loud pool party the last day I was there. Otherwise, it just felt like a well-managed family-friendly resort, not necessarily a Disney property. Alright, so here’s the deal. If you want a hotel that’s clean and well-maintained, with lots of stuff kids (definitely 12 and under) to do, I’d definitely consider Disney’s Aulani. With so much to do (and safely, that is) combined with our own excursions and eating adventures, it was the perfect home base for us. You can also purchase a excursions directly through Disney, so even if you don’t rent a car, you have opportunities to see other parts of the island. That being said, if you’ve got older kids, I’d say look at other options. If you’re looking for some night life, stick with Waikiki. If you’re a foodie and don’t want to be responsible for most of your food, and don’t have a desire to drive to find good food, think twice. And, if you’re looking for a heavy duty Disney experience, I think you’ll disappointed. I’m not a big Disney person, so I was fine, but if I had expected lots of Mickey and Minnie and all that jazz, I would have been bummed. All that being said, with a car and our fridges stocked, we had a fantastic time and felt like our experience was well worth the money. We went in November & LOVED it!! Poolside service was not slow (we rented a cabana so maybe that’s why). We will definitely return!! It was the right amount of Disney for us & we are into Disney over here for sure!